The Chicken Wire is a wiki for poultry enthusiasts. It’s a way for people with chickens (and other types of poultry) to post information and questions, to share information, and engage in discussion and chat about backyard flocks. Begun in January 2014, it make take awhile to develop. Consider contributing to it. Just click on the link below to be taken to The Chicken Wire wiki; you will be given the opportunity to create a username and password. For the meantime, this Wiki is private (which is why you will need to create a username) – to discourage spam and other unwanted messages. thanks for starting and keeping this blog. My family and I have recently moved to north Pole and this resource has been invaluable. I am a new chicken owner and I have really enjoyed having them. I love their individual personalities and, so far, they’ve been really easy to keep. But I have a couple questions. I have 4 hens (mix of barred rock, black austrolorp and buff orpington) and a rooster (barred rock) housed in a small (8×10) coop. The birds just started laying about a month ago but not all of them are laying in the nest boxes. I find about half the eggs laid underneath the nest boxes. The nest boxes sit about 3 feet off the ground on legs and I’ve provided a roost bar just below the boxes, about 1 1/2 feet off the ground. The boxes are filled with lots of fresh wood shavings. How can I encourage my hens to lay in the boxes? Also, they do not seem to use the roost bars. I’ve provided 3 bars (painted 2x4s) that sit 2, 3 and 4 feet of the ground. The bars are positioned so that they “stairstep” up to the highest bar. Are the roost bars too high? How can I teach or encourage them to use the bars? I can send photos to anyone that might have suggestions, if that would be helpful. Thanks! Hi Kristin I had my boxes upended when I started, now they are on the floor. In my experience just since feb this year. The roosting bars need to be higher than the nests. I’ve since put my nests on the floor. And built roosting bars from 2by4s, they love it. By rearrangoing the coop they have 3 bars and more space. How to put a pic on here to show you?? 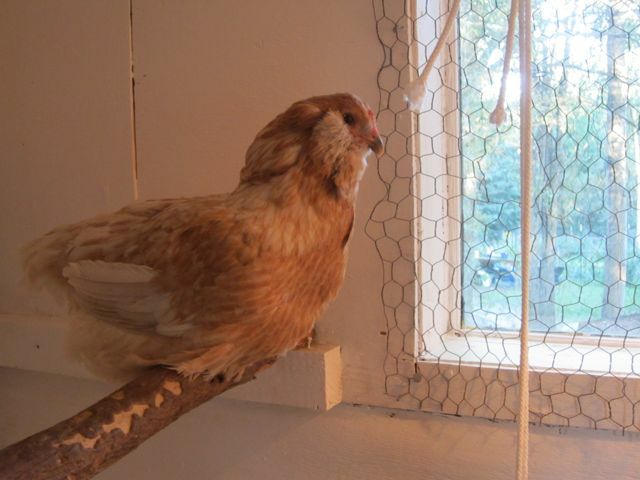 Hi Kristin : I copied your questions over to the Chicken Wire – to enable a wider audience of chicken owners to answer your question. In the meantime – here are some thoughts. Without photos it is hard to say for sure, but 2x4s sound a little wide for their feet. I generally use round perches, like thick dowels, or more commonly, I just cut a stiff, relatively good-sized branch from a small alder or willow bush and nail that up for a perch. Rounded forms are better because if you think about it – the things birds normally roost on are round – and their feet are designed to close around round, not square or angular things. When roosting, they prefer to be able to close their feet nearly around the roost. Are the nest boxes enclosed on all sides but the front? Are they big enough for a hen to comfortably sit in? Is there a ramp to the boxes, and more importantly, is there a small shelf in front of them so that the hens can walk up and into them? It might be that the hens are having trouble getting into the boxes. The other possibility is that they dont like wood chips/shavings for bedding. Try putting some straw in the boxes. I use a mixture of wood shavings and straw. Since your hens are beginning to develop the habit of laying on the floor, and if you are around during the times that they typically nest, you may want to try being vigilant and going into the hen house frequently to re-locate your laying hens to encourage them to go to the boxes. Otherwise, you can try making the floor area where they are laying eggs unattractive to egg laying by temporarily making it unavailable (block it off with some scrap wood or something like that). I think though, that I would try straw in the boxes first, and make sure your hens can easily get into the boxes. I sure could have used a site like this a few years back. I’m looking forward to the discussions! Thanks for the great information. I’m a first timer so have a few questions. How many laying boxes should I place in the coup for four ladies (one Buff, three Road Islands)? Planing to build our coop. Any suggestions or pitfalls to watch out for?